All of the third years are working very hard to finish off their final projects, seeing as they only have a month left of class! How exciting! In the next few weeks, we would like to introduce some of the students and their projects! This week we will introduce you to Megan and Shelley! For my Final Major Project, I have created a collection called the Sunset Cocktail Lounge. The theme that I explored is ‘one’s past’, and the manner in which it shapes each and every unique individual. Whether it is the stories from a parent, grandparent, or events in one’s own past, it all comes down to emotions and ideology that shape each and every one of us in a different way. Although we are all very different and unique, there are certain elements that remain the same in all of us, due to age and experience. Emotions such as love, hatred, anger, betrayal, forgiving and forgetting, learning, coping, and growing are all experienced for a first time and are all stages in life that one faces and goes through. Since the start of the academic year, I knew I wanted to do something that would bring value to me starting my career. I wanted to set out with a project that would make me independent and to have the opportunity to use all the knowledge and skills I have learnedW during my studies and combine this into one final project, to start me on my way towards a new innovative solution to how businesses can work. Therefore my final major project is based on creating a ‘how to’ agency that focuses on giving master-classes and traineeships, to educate those who either need to update their skills within social media, or who need to develop a clearer understanding and learn how to maximise the use of social media to create brand awareness and content. The company “Intersocial“ will be located in Germany but will be looking at growing internationally using technology such as virtual reality, that enable the world to connect with people internationally. ‘Intersocial’s’ vision is to strive to help individuals fall in love with every feature of social media and the digital marketing industry. With classes that are full of group discussion, exercises and live industry, one will learn about the online world, through an offline platforms. 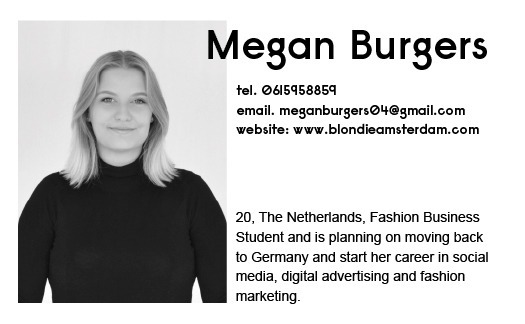 With this vision I hope to create a successful business that will help and educate people, just like the Amsterdam Fashion Academy opened my eyes to the industry.